JaiseAnn is at an age right now where she is learning so much. Most of what she's learning is coming straight from watching me. She "cooks," "cleans," and loves on her baby doll. Her most recent development is folding her arms for the prayer. We pray over every meal and I usually hold JaiseAnn in my lap and fold my arms around her and bow my head. The other night, we were getting dinner on the table and as we were getting ready to scoop JaiseAnn up to put her in her chair, we noticed she was already folding her arms. She knew it was time to pray. What a humbling experience for Zach and I. She truly is watching everything we do and soaking it all in. It has made me think a lot about some of the things Zach and I do and the lessons that she might take away from them. Date nights are one of our regular priorities and I've been thinking a lot lately about what I'd like JaiseAnn to learn as she watches her parents date each other. It's not hard to imagine why some kids would grow up thinking marriage isn't fun. I want JaiseAnn to see that Zach and I plan fun activities and enjoy each other's company. I want her to know that we are best friends and that while marriage involves parenting, running a household, and being responsible--it is also fun. By taking the time to enjoy one another I hope that she will see that. Chivalry isn't lost on anyone in this house. It's important to Zach and it's important to me and we hope it will be important to our daughter. Zach opens the door for me, takes good care of me, and treats me with such respect. 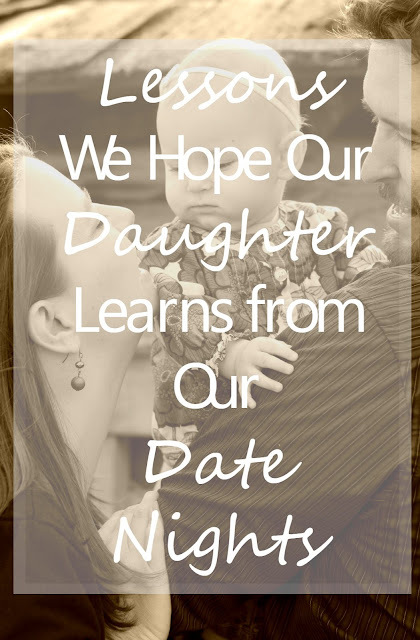 While we hope JaiseAnn picks up on this all of the time, we hope that when she sees her dad open the door for me when we're on a date, she'll learn that she should always expect to be treated with the utmost respect. We also hope that she'll expect to marry someone who will continue to date her and respect her. I hope that JaiseAnn will see that I make plans for date night often and I get dressed up. I make an effort for date night. We make time for each other and we try to make that time count. I hope that my daughter will see the importance of time and effort when it comes to showing your spouse that you care. This lesson is the one I hope she walks away with more than anything. I can't imagine anything more secure for a child than to know and understand that her parents love each other. I hope that the feeling in our home continues to be peaceful as Zach and I show her that we are important to one another. Making this time for each other helps maintain our friendship and partnership in adult responsibilities throughout the week, which continues to keep our home our little refuge. Ultimately that's what I want most for JaiseAnn, Zach, and myself. What do you hope your children might learn from watching you?